"Guns Eagle... I mean, Up." Keeping tabs on Tuberville’s career at Texas Tech has been surreal to say the least – after that first ‘Guns Up,’ I couldn’t remember my name for a second. Even if you want your ex-wife to be happy, it’s still weird seeing her strut down the street with another fella… even if you smile when she slips up and accidentally says your name instead of his. Tommy Tuberville wants fans to be a part of the new Raider Walk, and by all accounts the first session of it was a huge success. Raider Walk is a new event where Tech fans, cheerleaders and band members line the street about two hours and 15 minutes before kickoff, and the players and coaches walk through that line. For the SMU game, some 12,000 fans joined in, and Tech officials expect that figure will swell for the Sept. 18 game against Texas. For a moment, Tuberville inadvertently talked as if he were still coaching the Auburn Tigers. 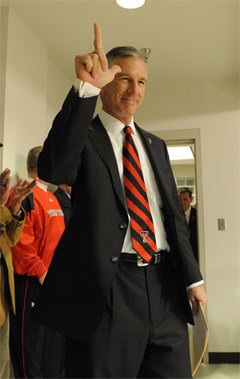 “When we have an away game we’ll have the Tiger Walk sign,” Tuberville said. “It’ll be a shorter walk, but at least it’s something where fans that get there can form some kind of line starting with the Tiger Walk. “Raider Walk” was bound to happen – Tommy seemed genuinely in awe of Auburn’s traditions, the eagle flight especially (I can’t find it, but there’s a video where he almost gets emotional talking about it). 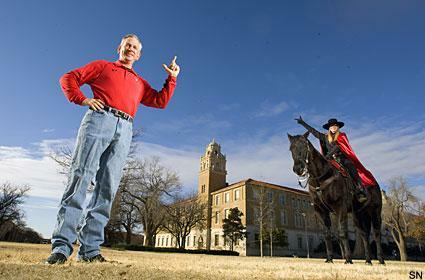 … so yeah, next season, he’ll probably convince TTU officials to strap a prairie dog to a hang-glider and push it off the flagpole. No barriers? At least they’re doing it right. Confession: Behind only “War Eagle” and “Thunder Up”, I always thought “Guns Up” was an awesome battle cry. Attaboy, Tommy. Still doing the right thing by your team and players. How anyone could begrudge you that is beyond me. War Eagle, and Guns Up! I am now dying to see a prairie dog on a hang glider. But I would settle for an armadillo being shot from a catapult. So… Mark Sanchez is a Texas Tech fan/student now?